Offering abundant woods, hiking trails, sandy beaches, and a picturesque rocky shoreline, Peaks Island is an island community unlike any other on the Coast of Maine. It is the essence of a village community and all just minutes from downtown Portland, Maine's largest and most vital city. With 1,200 year-round residents and 4,000 in the peak of the summer, people recognize Peaks as the most populated of the Casco Bay Islands for a reason. It's beauty, sense of community and accessibility have attracted a diverse group of people - from artists and attorneys to fishermen to doctors who maintain a quiet, safe, relaxing lifestyle. Island facilities offer a full service grocery store, two restaurants and a couple of other eating establishments. There is an elementary school for grades K through 5, child care facilities, a tennis and sailing club, a health care clinic, fire service, and 24 hour policing (although crime only enters Peaks Island life through the newspaper or the evening news). All the amenities of life on the mainland are available to Islanders with very few of the problems, Electric service, telephone, cable TV, public water and a state of the art sewage system serving about 250 homes. A two pump gas station serves the Island's vehicles which can come and go from the mainland on the most used ferry, holding about 12 cars or trucks as big as moving vans. Those who come to live on Peaks Island appreciate that it's not for everyone. It's an idyllic way of life that still provides them easy access to one of the most charming cities in New England - whether it's just enjoying the summer months full of sailing, swimming, tennis in coastal Maine. In the autumn, Maine radiates in its full glory, through winter when despite many peoples perception it´s probably a little milder on the island than on the mainland (and certainly more beautiful). 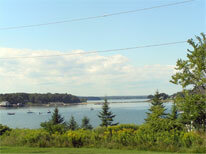 In the spring, new life abounds, especially on a Maine Island - its beauty is reenergized once again. If you and your family are looking for an unforgettable experience, both different and rewarding, we at Port Island Realty are here to help. 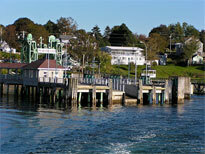 We will share our knowledge of Island life to create an exceptional stay for you on Peaks Island. We realize that though it´s not for everyone, it may be right for you. Whether it´s a day or a decade, we hope you enjoy yourself while you're here!